Even after working in and out of Afghanistan for the past four years, Andy Moles will only leave his Kabul hotel room to go to the cricket. Moles, an amiable 58-year-old Englishman, has a brother who works in counter-terrorism, so he isn’t about to airily dismiss the advice of his security detail. “We do our day’s work, go back to our beds, and that’s it,” the veteran coach says. “I’ve not walked around the streets in all the time that I’ve been there. “It’s not recommended or safe to do that. “When I’m in Kabul, I’m in the hotel or at the ground, which is heavily fortified with guards and soldiers. The security concerns are not the paranoia of the over-cautious. In addition to the threat of suicide bombings, kidnapping is rife, with gangs or militants routinely targeting foreigners and then demanding a ransom. One report last year from the Institute of War and Peace Reporting stated they were occurring at a rate of one a day. Adam Hollioake, who shares a country and a craft with Moles, coached in Afghanistan’s Shpageeza Cricket League in 2017. He was dealt the same strict instructions as his compatriot, then one day had it reinforced by star fast bowler and Afghan native Shapoor Zadran. “Shapoor cruises around the street in his little Toyota Corolla,” Hollioake says. “I said to him one day, ‘I’ll jump in with you, get a lift to the ground’. “He said, ‘You won’t make it. If they see you, you’ll get kidnapped’. Shapoor would know. In 2017, he and his brother were reportedly shot at by unidentified gunmen as they drove home on a Saturday night. Another Afghan star, allrounder Mohammad Nabi, had his father kidnapped and held for an AU$2m ransom in 2013, only to be released two months later without a deal ever having been made. The shocking stories are all part of a recent war-torn past from which Afghanistan is desperately trying to shake itself loose. In a cricket sense at least, it is succeeding; the story of the national side’s climb from the fifth division of the World Cricket League to Test status in the space of a decade is perhaps the sport’s most remarkable. Although based in the United Arab Emirates, last year’s inaugural Afghanistan Premier League was another seismic step, coming hot on the heels of a maiden Test outing against India. If momentum was everything, Afghanistan cricket would be made. But two bomb blasts in the 12 months prior had been a terrifying ground zero from which to rebuild. They were also a stark and tragic reminder of the realities of life in the Asian country, even as cricket continues to provide a source of optimism for its people. Mujeeb Ur Rahman turned in a complete circle as he looked around, taking in the scene. His gaze finally settled on the giant ‘Sea World’ sign and he smiled, as he had been prone to do recently. Here he was, all the way from Afghanistan, the youngest-ever BBL player, taking a day trip to Sea World. “It’s an amazing story,” says Brisbane Heat general manager Andrew McShea. “In Australia, we’re lucky, we take that kind of thing for granted, but when you think about where Mujeeb has come from … to be able to go and spend a day at Sea World, he just loved it. The following night, Mujeeb met his national teammate Nabi and Pakistani Usman Shinwari in an Afghan restaurant in Brisbane. The trio were all playing a KFC Big Bash match the next evening at the Gabba; Mujeeb for the Heat, and Nabi and Shinwari for the visiting Melbourne Renegades. By that point in the summer, Mujeeb had been to Melbourne, and to Sydney. In both cities he was shocked at the size of the Afghan populations, and the availability of his customary cuisine. “Brisbane is my favourite,” he said in his heavily-accented English. “Sydney, Melbourne – so big.”A couple of weeks later, after his final match for the Heat (in which he collected 3-16), Mujeeb spoke with a small contingent of media on the Gabba outfield. An enthusiastic individual of Afghan-Australian background had been plucked from the crowd to stand beside the teenager and translate if required. He grinned as he explained how he had been a quasi-tour guide for Mujeeb throughout his time in Brisbane, taking him around the city and exploring the Gold Coast to the south and Sunshine Coast to the north. Mujeeb spoke haltingly in English and then in rapid-fire Pashto, expressing his love for Australia, his excitement at the prospect of playing the five-times world champions in this year’s World Cup, and the fact that the Big Bash had been excellent for his development as a spin bowler. Afterward, he offered a quiet query which revealed more about his character than anything from the three-minute interview preceding it. At that, Mujeeb smiled again, his dark eyes sparkling. Moles, who is responsible for the development of Afghanistan’s best in the 19s and 23s age groups, describes the story of 17-year-old Mujeeb as being “at the top of the pyramid” when it comes to the players he sees coming through the country’s ever-improving cricket system. “In my position, I see a tremendous bunch of talented, passionate and hungry young players, and for them, cricket is a way out of poverty,” he says. “That drives them on to work harder and harder. “There’s one or two that come from family money if you like but the majority of them – and I’m talking about 90 per cent of them – have all come from refugee villages when they were youngsters growing up after the Russians and then the Americans invaded. The opportunities Moles refers to stretch well beyond the parameters of cricket. When Afghanistan were in New Zealand for last year’s Under 19 World Cup, the news filtered through that Mujeeb had earned an Indian Premier League contract worth around AU$785k. It appeared a remarkable gamble from IPL franchise Kings XI Punjab; an incredible sum of money to splash on a teenager from Afghanistan. But as the cricket world raised a collective eyebrow at the deal, Mujeeb’s world changed irrevocably. “That amount of money for him and his family was absolutely staggering,” says Moles. “I mean it’s a lot of money for you and me, but for him, who literally has come from nothing, the word life-changing doesn’t do it justice. There were simpler stories from that tour that epitomised the life-altering impact of cricket on Afghanistan’s young players. “Four or five of those guys in that squad had never been outside Asia,” says Moles. “And for them to go to a country like New Zealand, just for the life skills, just to see life outside a war-torn country, that in itself is very rewarding. Everywhere Rashid Khan went, he was offered sympathies and well wishes from his countryfolk. In January, he had made a flying visit home between Big Bash matches to mourn for the passing – and celebrate the life – of his father, a man from whom he says he learned the most valuable lessons in life. “I was home for 36 hours, and my total flights from Adelaide to Afghanistan return was something like 38, 40 hours – so I spent more time in the air than I did at home,” he tells cricket.com.au. “But if it was triple that, I would have done that. One hundred times. It was something I had to do. “I got lots of love from the people, they really give me love and support. As people came to pray for his late father, Rashid read from the holy Quran, and spoke for his 10 siblings, the same brothers and sisters who never miss one of his matches around the world from their televisions back home. Among Afghanistan’s 37 million strong population, Rashid is a bona fide superstar. Murals of his image adorn city walls. It is little wonder. The 20-year-old leg-spinner is the world’s top-ranked T20I bowler. In ODIs, he is No.2 on the bowling rankings, and the top-ranked allrounder. “It is quite difficult for me to go outside in the streets,” he says. “I never had dreams to play for my country or to be number one bowler in the world, and to play in all these leagues in a very short period of time. “I was not expecting to play professional cricket, (as kids he and his brothers) were playing with friends. People started telling me, ‘You have the ability to go ahead and focus on cricket – you can be a big, big player’. Rashid spent a significant chunk of his childhood living in the Pakistan city of Peshawar as war took hold in Afghanistan. He doesn’t know exactly how many years he and his family were there (the best guess appears to be around six), and with a Pashtun population and a culture very similar to his home in Jalalabad, the displacement was not as jarring as it might have been. “But we always know that it won’t be our home for all time,” he says. “One day it will come that we will go back home and we will have our own country, we will have our own home in Afghanistan. His father, he says, was not a storyteller of the past; anything he had seen or experienced in their homeland in the decades before Rashid was born was kept to himself. Instead, he focused on looking forward – a trait that Rashid has adopted. “He never talked about what happened in the past, how it affected his life,” he says. “He doesn’t want to tell us negative things. He always kept us positive, kept us motivated. “He always give us great lessons which is helping us right now. He tell us how to be very strong in difficult times, how to be your best and control yourself in that. Yet as the consequences of the US invasion of Afghanistan in 2001 and the terrorism and insurgency associated with al-Qaeda and the Taliban continue to be felt, there is no escaping the reality of their country’s history. With a new generation however, comes new optimism, and Rashid is the personification of that hope. “The kids play cricket on the streets, on rough areas of ground,” Moles says. “You see videos of Pakistani and Indian youngsters playing on a patch of dusty ground – that’s exactly the same as Afghanistan. 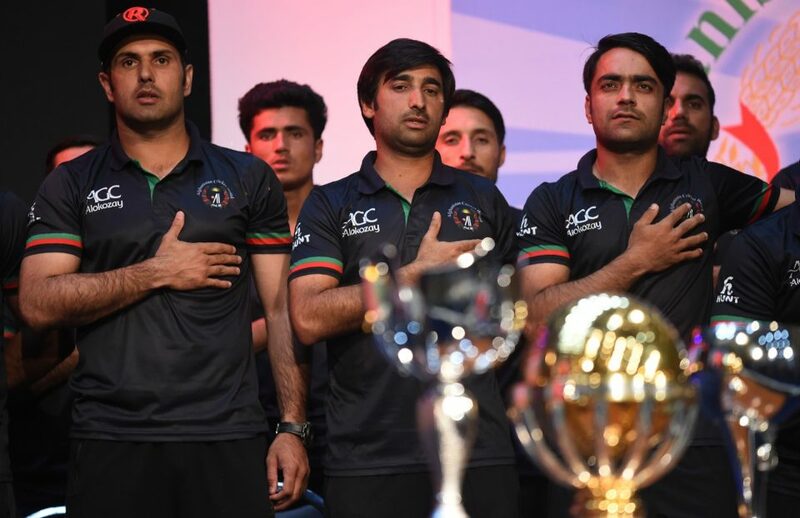 Afghanistan’s startling rise through the cricket ranks – underlined most recently by automatic qualification for next year’s World T20 in Australia as one of the ICC’s top-eight ranked teams – has earned them increasing amounts of funding from the sport’s governing body. Domestically, the Alokozay group – a multinational company that produces everything from tea to baby products – signed a 10-year deal as a major sponsor following the 2015 World Cup. The upshot has been improved facilities, better-run competitions, and high-performance for the elite squads. “The Afghanistan Cricket Board have regions, and they play under-17s and under-19s, then they have their own provincial teams,” explains Moles. “So while it’s still in its embryonic stages, it’s set up very much like your Australian or English cricket. “From the clubs you go to the state teams, then to the U17 and U19s (national) teams. Every year there’s an U19 national tournament, and there are four-day and one-day tournaments played between the provinces. Veteran Afghanistan allrounder Nabi has witnessed the transformation from the desolate days immediately following his family’s return from Peshawar to his home country, to the burgeoning progress of today. “There is a lot of quality cricket in Afghanistan going on,” he says. “We have good structure of cricket now. We have domestic, we have four-day, we have one-day, we have two-day, we have club cricket, school cricket. Running parallel with the developments have been ongoing recognition from the ICC, and improving results from the national side. Afghanistan’s admission into ‘Full Member’ status brought with it Test cricket in 2018 – a scenario unthinkable only a decade ago. “I think their case was (irresistible), yes,” says Moles. “They’ve put the structures in place, got promotions through the ICC’s leagues, and their performances over the last five years have improved every year. “They’ve managed to represent themselves well against full member nations, and with Ireland, they were at the top of the pile when it comes to the Associates. Against Ireland in last month’s three-match T20I series, Afghanistan showed the gap they had put on their fellow Full Member rookies, clean sweeping them and producing a number of remarkable individual performances in the process, including a head-turning 162 not out from 62 deliveries smashed by 20-year-old opener Hazratullah Zazai, and four wickets in four balls from Rashid. In last September’s Asia Cup – a 50-over tournament – they beat Sri Lanka, thrashed Bangladesh and tied with India, while a year earlier, Moles’ Under 19s won their first-ever Youth Asia Cup. The veteran coach has spent time this year with the preliminary World Cup squad in Bengaluru, where they held a 30-man camp to hone their preparations for the tournament. He sees considerable advancements from the squad he took to the 2015 edition. “Four years ago I was in charge of the national side (at the World Cup) and we did OK, but I think we did what was expected of us; we beat Scotland and we struggled against the full members,” he says. “Since then, there’s been a growth in the players. It’s not about one or two people making a team, but with Rashid, Mujeeb and Nabi playing the way they are at the moment, you put the advancements and the quality of those three into the team that we had four years ago and you’ve got a really strong unit. “They did themselves no harm at all with the way they played in the Asia Cup, and they’ve been working since on getting up from average scores of 260-265. There’s been a big push technically and mentally with the batters, Phil (Simmons, head coach) has done some really good work to try to get them hopefully up to totals of 300 for the World Cup. “With our bowling attack, we believe if we can get to 300 – and that’s not going to be easy with the strengths of the sides – then a lot of teams will find it difficult to score 300 against our attack, especially our spinners. Perhaps most impressively, the Afghans have found a way to flip into a positive what has in their brief history been one of their most significant challenges; the poverty, violence and oppression they and their families have been forced to endure has built a resilience and a fearlessness that has become synonymous with their brand of cricket. “The culture and the attitude of the Afghans is never say die,” Moles says. “You think about where a lot of them have come from, and the hardships they’ve had in life – they’re not scared to play against anybody. Hollioake and Moles were coaching their respective T20 sides in Afghanistan’s Shpageeza Cricket League in September 2017 when a bomb blast shook the Alokozay Kabul International Cricket Ground. The bomb was believed to have been intended for the venue itself, however the suicide bomber had been stopped at the farthest checkpoint, killing two others in the process. “I felt the explosion, and I’d never heard a bang like it,” Hollioake recalls. “We got told pretty quickly it was a terrorist attack. We finished the game and then they gave us the option if we wanted to leave (the country) or stay. Around half the guys took off – Herschelle Gibbs and quite a few of the players from South Africa, who were ordered by their Board to come home, were out of there that night. “You could literally see the devastation in the faces of the people who had spent months trying to get the event up and running, and fighting against the opinion that their country is unsafe. All they wanted us to be able to do was play cricket safely. Eight months later, four explosions at a cricket match in Jalalabad killed eight and injured 43. It was another major blow to the prospect of international cricket in a country still gripped by conflict. “When you drive from the hotel to the ground (in Kabul), every 200-300 metres there’s great big humvees with machine guns on the back,” Moles says. “There are armed soldiers at every junction and roundabout. “Every hotel, every bank, even a lot of houses have their own personal armed security. “But having said that, the ACB do everything they can to ensure my safety. Whilst you’re wary every time, I’ve got no issue with going there … once I’m at the ground working, I feel perfectly safe. As they prepare to play their second-ever Test match – against Ireland from March 15 in India – the date for an historic inaugural Test in Afghanistan remains as uncertain as ever. Last December, representatives from the United States and Pakistan Governments met to discuss the Afghan peace process, with reports that the Trump Administration had requested Pakistan use its influence to bring Taliban leaders to the negotiating table. “Pakistan has helped in the dialogue between Taliban and the US in Abu Dhabi,” tweeted former Pakistan cricket captain, now Prime Minister, Imran Khan. “Let us pray that this leads to peace and ends almost three decades of suffering of the brave Afghan people. Nabi understands more than most just how far his country still must come if it is to host international cricket. But the 34-year-old former skipper has ridden the remarkable wave of development across the past decade, and so his view is tinged with hope. “I’ve been there through the whole process,” he says. “When (the people in) our refugee camp went back (to Afghanistan) in 2001, we started cricket in the streets and everywhere. There was no proper cricket grounds, no academy in Afghanistan at that time. “We saw just everywhere bullets had hit the walls, everything destroyed, especially in Kabul. We build everything – small grounds – and we play our cricket. “Now you look at Afghanistan cricket, it’s on the top level. There is peace talking going on with Taliban and Government. Through his four years within Afghanistan Cricket, Moles has been increasingly delighted by the talent he sees working its way through the elite ranks. Presently, he feels there are at least another half dozen players from Afghanistan’s Under 19 World Cup semi-final squad who will likely transition into full international cricket in the coming years, but he warns that encouraging sign could become an issue if not handled correctly. “The biggest challenge ahead for Afghanistan now is the transition period,” he says. “They’ve got a group of players who have done a remarkable job to get Afghan cricket where it is at the moment, but at some stage the youngsters have to come through, and I think managing that progress will be a difficult situation. “The players who have got them to where they are now need an exit strategy in terms of where they go to from here in their cricket career. That will be a challenge. They’re all so passionate, they all want to play. Having witnessed firsthand the fervour the Afghan people have for cricket, Hollioake sees a not-too-distant future in which the country is a genuine global force – particularly in the limited-overs formats. “There’s obviously a lot of factors that go into it, but it would not surprise me if Afghanistan became the best side in the world in the next 20 years,” he says. Rashid too, is always one to view the future with positivity, just as his father taught him. “The talent I am watching in the youngsters who are coming up is incredible,” he says. “We will (become) a team that can beat any team in the world. “We just need a little bit more time in Test cricket – we need to play more teams, and I think we have the best talent. We will be better if we play more against teams with good players, and more international games will give us experience, and something to learn from and work on.